When it comes to trying to choose the right BBQ grill, opting for charcoal over has is a no-brainer. The old school method of cooking has long remained a favorite over the newer, gas-based approach due to its beautiful results. Lumpwood charcoal creates an authentic smoky flavor that stays faithful to what we identify as ‘real’ BBQ cooking. Finding the right type of lumpwood isn’t easy however. Different brands and types are of varying levels of quality, and many even impart wildly different flavors on your food. My guide here is on hand to help you separate the wheat from the chaff, and help you choose the best lumpwood charcoal for your needs. 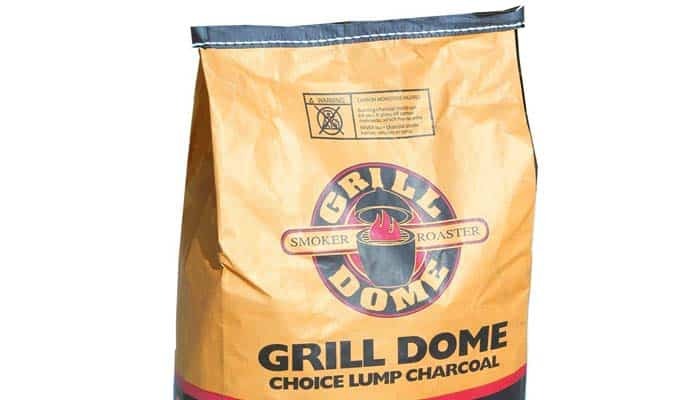 Lump charcoal is the product of a long burning process whereby wood is burned in a low-oxygen environment. This burns away any sap and water, and ultimately leaves something that’s close to carbon. This is lump, and is charcoal in its most natural form. The purists swear by it and so should you. It’s not just blind loyalty to charcoal purity that sets lump apart however. It has a lot of other qualities going for it too. It burns at a much higher temperature, it’s really easy to light, and is a lot cleaner than briquettes. Lump also responds well to oxygen, which makes it easy to raise and temper the heat levels for your grill if it has top and bottom vents. Lump Charcoal vs Briquettes – what’s the difference? One of the most common choices new barbecuers face is between lump or briquettes as their fuel choice. Let me try to nip this one in the bud for you immediately and tell you to always go for lump charcoal. 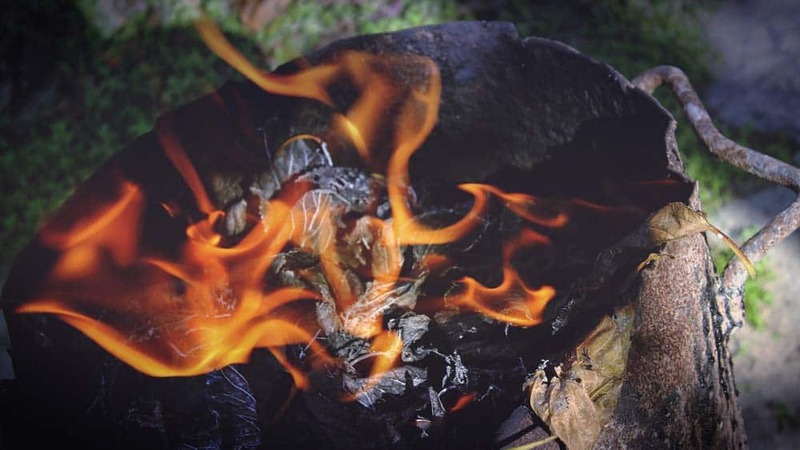 As a more organic and real fuel source, charcoal isn’t mixed with the kind of fillers or additives that briquettes are. Not only does this mean that it’s healthier and more environmentally friendly to use, but the flavor that it then imparts on your food is as pure and authentic as BBQ fuel goes. Not only this but, due to its dense composition, charcoal burns at a higher temperature for longer. Admittedly, briquettes do tend to light a bit more easily than lump, but their performance and authenticity pales so much in comparison to lump that I would never recommend opting for them. The bigger the chunks, the better the fuel efficiency of your charcoal, so always be on the lookout for bags that contain a healthy number of large chunks. The larger pieces are also great at aiding temperature control, whereas smaller pieces are prone to blocking air passages and take longer to light. Not only this, but if you are using cheaper charcoal then the composition will be more made up of fillers, which means that smaller pieces will be almost unusable. Go large as much as you can. A safe rule to live by when choosing your coals is that bigger is better. When pieces are larger, they invariably burn for longer and also at hotter temperatures. Always opt for larger pieces, and as you use different brands make sure to make a mental note of which ones serve up the most generously sized pieces at good consistency. Also note the amount of dust sitting at the bottom of the bag. 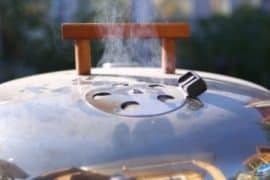 You want to avoid dust as much as possible as it can clog your grill or smoker’s vents, and doesn’t really serve any use. When picking your charcoal, only go for bags labelled ‘hardwood lump charcoal’ or ‘100% all natural’. Non natural briquettes are convenient to use, bit they’re always packed with chemicals, fillers and binders. These will heavily impair the quality of your meal while also being incredibly bad for the environment. So with all of that in mind, here are our 7 picks of the best lumpwood charcoals out there. When pushed to give you their choice of their favorite type of charcoal, the majority of BBQ enthusiasts will recommend natural hardwood. 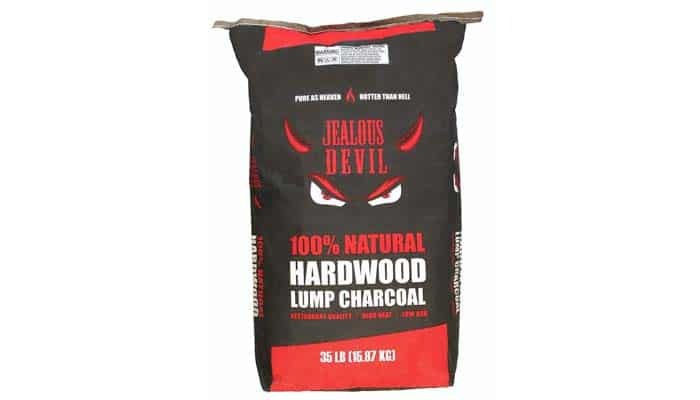 Often made from oak and maplewood, natural hardwood is one of the cleanest and reliable lump charcoal types out there. The Fogo brand is long associated with good quality BBQ fuel. They always use Central American Hardwood; a manufacturing choice that has seen them produce reliable, powerful fuel for years. Fogo produces fuel that has all the perfect characteristics for excellent charcoal. This charcoal from Fogo comes in large pieces, which ensures high cooking temperatures and a long cooking time from just a handful of coals. Even just a handful of charcoal pieces should get your BBQ fire going, an even fewer need to be added to keep it going thereafter. As I mentioned when saying why you should choose natural hardwood over chemical briquettes, the quality of charcoal will heavily impact the taste of your food. 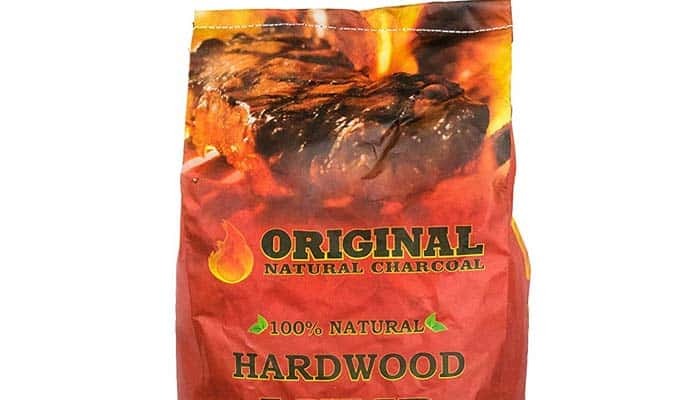 This Fogo hardwood charcoal helps infuse the meat with a beautiful smoky flavor. This charcoal is perfect for a whole range of foods, and not just your typical BBQ dishes of brisket, burgers or ribs. This coal is also great for fish like salmon and halibut, and vegetables alike. This is particularly welcome given the high temperatures of the charcoal. Matching their brilliant cooking temperature is also their quick fire starting and long cooking time. 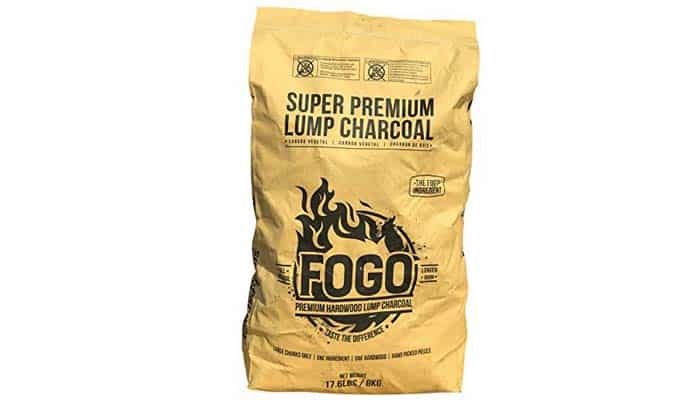 Natural hardwood lump charcoal is well known for keeping its smoky aromas for hours on end, and Fogo’s charcoal fits the mold perfectly. The large size of each coal ensures long heating times. For the environmentally-conscious of you, Fogo have committed to only making their charcoal out of already fallen trees, meaning their environmental impact is minimal compared to other brands. This is another product listed as all natural and it really does show when put to the test. 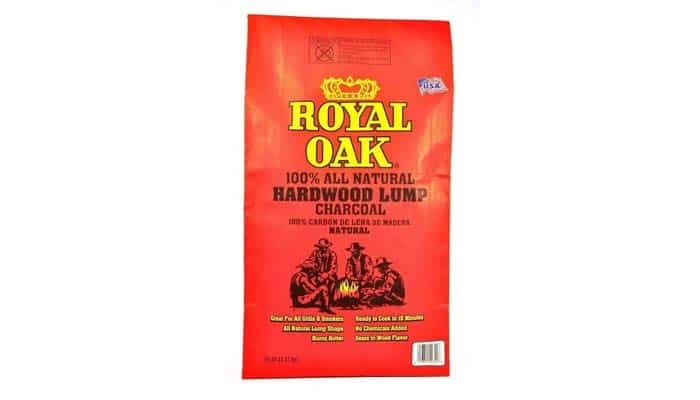 Royal Oak’s charcoal is of fantastic quality, and emits a beautiful smoky aroma. Just like you would want from natural hardwood, it contains no form of filler and minimal junk in the pack. Royal Oak’s coals are really quick to light, only taking 15-20 minutes to reach a strong cooking temperature. Not only that, but the coals stay lit for hours, making them ideal for smoking. What sets these coals apart is the impressively low amount of ash that they give off during burning. One of the pain points of smoking is the frequency with which you need to empty your smoker’s ash drawer, however Royal Oak have created a product that cuts down on this significantly. This leaves you able to have a more hands-off approach to cooking, while also keeping your grill relatively clean. This charcoal is made specifically for smoking, and it shows. It cooks for long periods of time, while its rather more modest maximum temperatures make it easy to control cooking heat levels. This charcoal from Quebracho is a perfect example of how the natural aromas and flavors of natural coals are superior to anything that artificial briquettes or propane can muster. Derived from South American wood, this stuff is typical of fuel from the region in that it’s packed full of that distinct smoky flavor unique to natural hardwood. It can also cook at high temperatures for hours, yielding an impressive maximum of 1000°F. Similarly, it’s easy to bring it down to a smolder of 200°F for ‘low and slow’ cooking, burning for 3-4 hours. 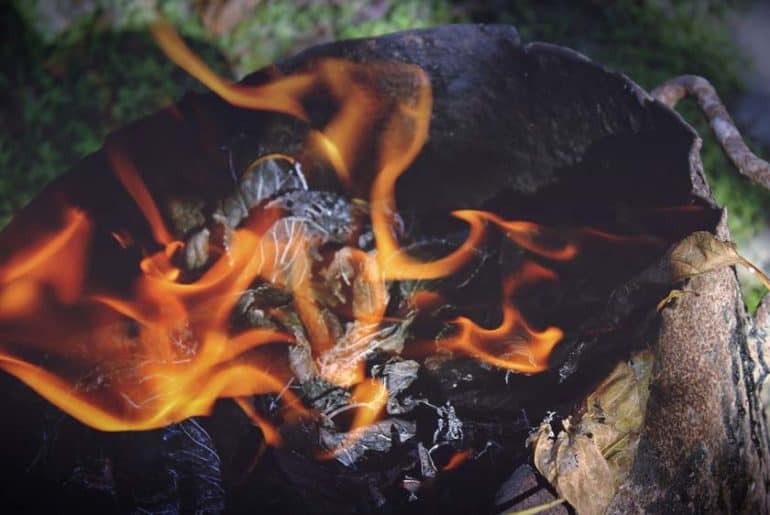 Just like with a lot of the other lump charcoal packs in this list, Quebracho Carbon can reach optimum cooking temperatures within just 15 minutes. Not only that, but it’s clean relative to a lot of other charcoals, leaving minimal ash or residue when cooking. Mangrove is best for people who are unsure about strong smoky flavored meat, and prefer something a bit lighter and more subtle. Because the flavors and aromas of this coal are much more slight than the others on the list, it’s important you avoid the use of lighter fluid. It’s a lighting method that I try to avoid at the best of times anyway, but can make for a reliable shortcut to BBQ lighting. However, with Mangrove you risk the nasty taste of the fluid completely overpowering the coals so it’s best just to stay clear. 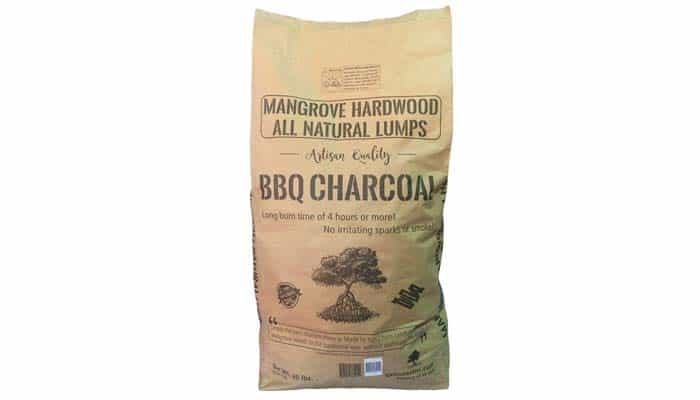 Like with the majority of coals in this list, Mangrove is made with dense hardwood trees. This ensures a solid coal that can sustain its heat for hours with hardly any temperature fluctuation. While originally a Japanese invention, kamado grills are hugely popular in the USA. Their popularity has been largely down to their strong insulation, and reliable temperature levels, making them perfect for roasting and smoking. These coals come in large pieces, so you can get a lot out of just a handful of them while also achieving impressive maximum temperatures. 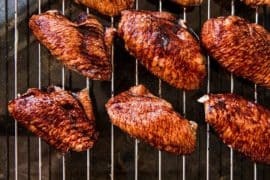 Fan of smoking will get a great bang for their buck out of these as these can smolder at low temperatures while keeping the flavors of your meat locked in. The Jealous Devil has a really unique almost-burnt aroma, making it absolutely perfect for grilling. These coals are made from the Quebrancho Blanco tree. This tree gives the coals a superb density, which in turn gives your BBQ-ed food a fantastic smokey flavor. The coals can reach a temperature high of an almost ludicrous 1172°F. This gives it an incredible sear for BBQ grill staples, like steaks and burgers. Its density almost means that it can burn for several hours at high temperatures. A number of large coal pieces do help make up some of the coal bag’s contents, but otherwise it’s medium-sized pieces. If it were any other brand this might put me off, however these Jealous Devils are so dense and so pack full with power that this doesn’t impact performance whatsoever. The long burning times and red hot flames that the Jealous Devil can achieve make this the absolute perfect fit for charcoal grilling. Matched with this are beautiful smoky aromas, chemical-free composition and very little residual ash. The perfect lump charcoal. 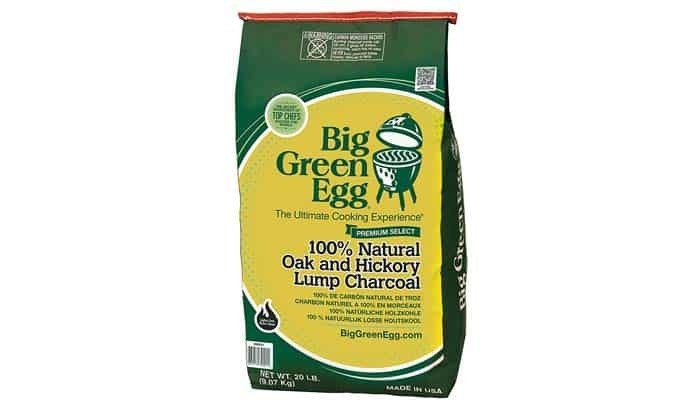 It should come as no surprise that the best lumpwood for the unique Big Green Egg models comes from the manufacturer themselves. Not only is it faithful to the natural ingredients that comprise lumpwood, making sure it doesn’t contain any fillers or chemicals, but it goes one further by containing 100% natural American oak. It’s an eco-friendly fuel that compares favorably to other charcoal on this list in terms of being green. Performance is also key however, and it doesn’t disappoint here either. It burns hotter while also minimizing leftover ash, making it clean in every sense of the word. The absence of chemicals in it does make it slightly harder to light, as well as requiring a longer heat up time, however this is more than a fair trade-off for the price of having a healthy, clean, environmentally-conscious product. Its composition also means that it imparts a beautiful smoky flavor on the meat without leaving any trace of chemical aftertaste. The perfect lumpwood charcoal.